The OME-A-826PG is a 16-bit multifunction analog and digital I/O board for PC/AT compatible computers. The OME-A-826PG offers 16 single-ended or 8 differential analog inputs, plus two channels of analog output with 12-bits resolution. In addition, the OME-A-826PG has 16 digital inputs, 16 digital outputs and one counter/timer channel. The OME-A-826PG provides gains of 1, 2, 4 and 8. It has a maximum sampling rate of 100 KS/s. DMA operation is jumper selectable for levels 1 or 3. Interrupts are jumper selectable between 3 and 15. 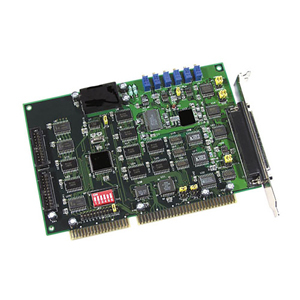 All data acquisition boards are supplied with a standard software development kit for Windows 98/NT/2000/XP. The software development kit includes DLL files for programming in C, C++ or other high level languages and OCX files for Visual Basic or Active X programming. LabView drivers are also included. 참고: Each OME-A-826PG includes complete operator’s manual and software development kit on CD ROM. OMEGACARE extended warranty program is available for models shown on this page. Ask your sales representative for full details when placing an order. OMEGACARE covers parts, labor and equivalent loaners.